He forced a smile as his first guests arrived early; he had not yet explored all permutations of pillow arrangements and it would vex him the entire evening. There are simply so many elements to this striking design that the proud owner needs not even explain his magnificent product of careful design. The patio area brings outside in, giving just enough space to unwind seated while being completely surrounded by trees, greenery and foliage. 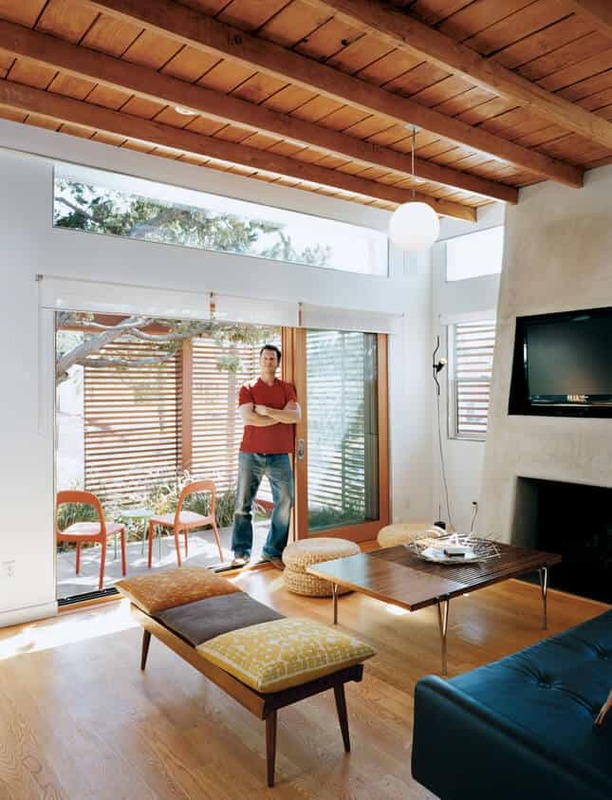 Wooden blinds work well to create a natural atmosphere while blending in the textures of the flooring and table. The use of blinds has been repeated, following good design dense, with the majority of light allowed in through massive panes seated rather high up. A patio screen prevents any glare from getting in the way of television viewing, while opening up easily to let the light in. Instead of a fireplace, the home theater has been placed in the recess with the television sunken into the frame above. The design works wonderfully, showing what a basic, bland, and antiquated fireplace can be transformed into given a bit of hipster ingenuity. Repetition is key to any successful interior design style. Two circular seating cushions pair to the three present on the bench, while being contrasted by a modern couch, which in turn brings together the blending of natural and synthetic elements of style found here. Wooden roof rafters openly exposed without a ceiling sets a great scene, while rounding off this indoor-outdoor combination living room to perfection.